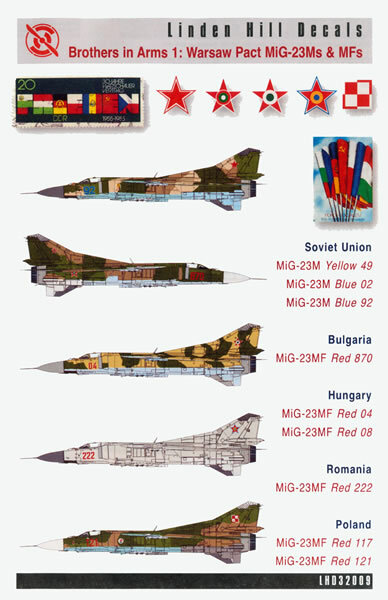 Brothers in Arms 1 Warsaw Pact MiG-23Ms and MFs Linden Hill Decals, 1/32 Scale. This is a great decal sheet from Linden Hill Decals. It provides you with markings for nine different airframes in a variety of camouflage schemes as well as with comprehensive support material to enable you to accurately portray your chosen subject. 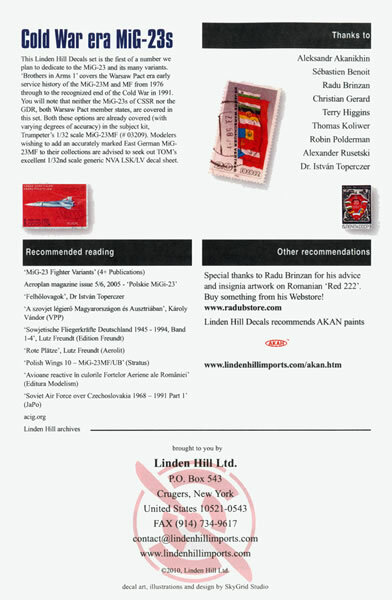 For the uninitiated, Linden Hill Decals is a subsidiary of Linden Hill Imports; a United States based company who hail from Krugers in New York. As well as decals they also import various other modelling lines including NeOmega and Moskit. 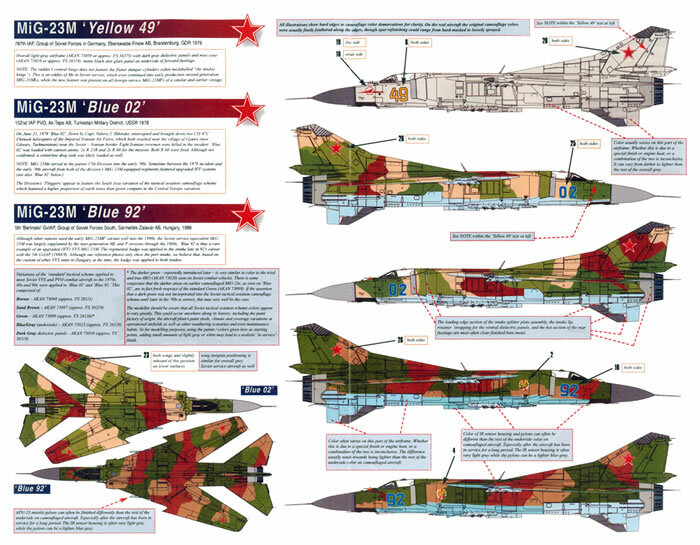 The new 1/32 scale Trumpeter 1/32 MiG-23MF kit has opened up a whole new world for fans of aircraft of Warsaw Pact air forces. Linden Hill decals has been quick off the mark and released a great new sheet that provides nine alternative options to enable you to finish the Trumpeter kit in markings other than the two found in the kit’s box. MiG-23M (early) 'Yellow 49', 787th IAP, Group of Soviet Forces in Germany, Eberswalde-Finow Air Base, Brandenburg, German Democratic Republic in 1976. MiG-23M (late) 'Blue 02', 152nd IAP PVO, Ak-Tepe Air Base, Turkestan Military District, USSR in 1978. MiG-23M (late) 'Blue 92', 5th 'Berlinskii' GvIAP, Group of Soviet Forces South, Sarmellek-Zalavar Air Base, Hungary, 1989. MiG-23MF 'Red 870', 18th IBAP, Bulgarian Air Force Dobroslavtzy Air Base, Bulgaria in1980. MiG-23MF 'Red 08', 1st Squadron, 47th Fighter Wing, Papa Air Base, Hungary, in the mid-1980s. MiG-23MF 'Red 04', 'Stromfeld Aurel' Home Defense Fighter Wing, Papa Air Base, 1990 (This option crashed on 16 September 1990 at Papa Air Base 'Open Day', killing its pilot Major Károly Soproni). MiG-23MF 'Red 222' 1st Squadron, 57th Air Group, Mihail Kogalniceanu Air Base, Romania in 1982. 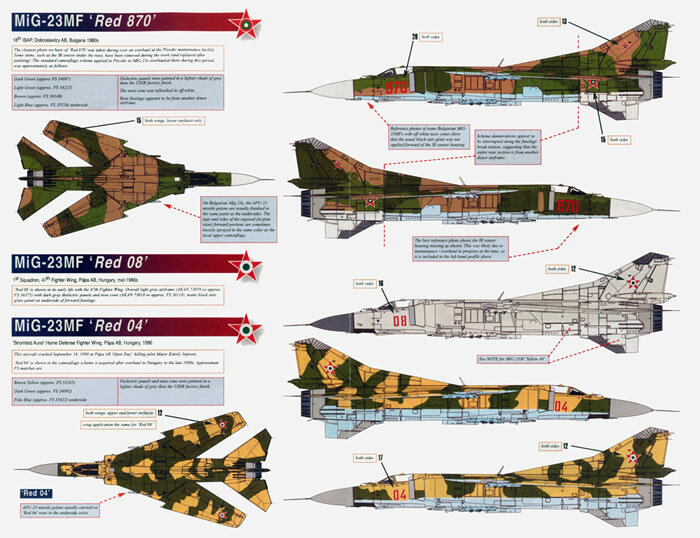 MiG-23MF 'Red 117', 28th PLM, Slupsk, Poland, in1989. 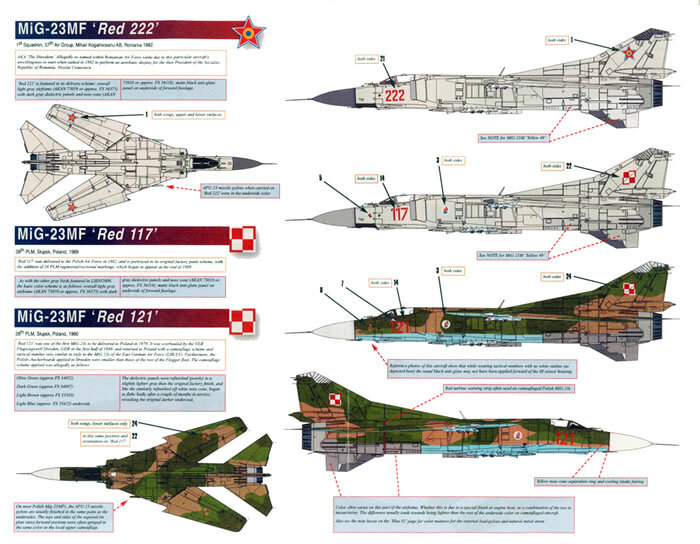 MiG-23MF 'Red 121', 28th PLM, Slupsk, Poland, in1990. The decals themselves are provided on two separate sheets. No advice is offered as to who printed them but they are all thinly printed and in perfect register. Carrier film is minimal and the colours appear to be correct. Whether or not the whites of the decal will be still be opaque after application over a dark camouflage scheme remains to be seen. National insignia, squadron markings and “bort numbers” are all that are supplied so you will have to rely on the kit’s sheet for the stencil data. The placement guide is in the form of two A-4 sized sheets with left hand side profiles of the three overall light grey options whilst the remainder of the camouflage options have left and right hand side profiles as well as upper surface plan views. There is also a single upper surface plan view for the light grey coloured options. The placement guides as well as the two decal sheets come packed in a clear plastic zip-loc bag.